Colloidal nanocrystals are crystalline spheres of a few nanometers, sometimes protected by a shell in order to improve their optical properties. They are very bright and stable emitters and their emission wavelength can be chosen over the whole visible range through the parameters of chemical synthesis (fig. 1a), and their optical properties compare to those of an « artifical atom ». We collaborate with the group of Benoît Dubertret at the ESPCI (Paris) which studies the synthesis of high quality nanocrystals emitting in the red-near infrared and the optimization of the nanocrystals shell in order to suppress their blinking. We also work with the group of Pham Thu Nga at the IMS (Hanoi). We perform ensemble measurements (emission and absorption spectra, decay curves, quantum yield, low temperature measurements) (fig. 1b) as well as studies on single nanocrystals with a confocal microscope (blinking, single-photon emission, coherence and spectral diffusion (collaboration J.-P. Hermier, GEMaC)...) (fig. 1c). Fig. 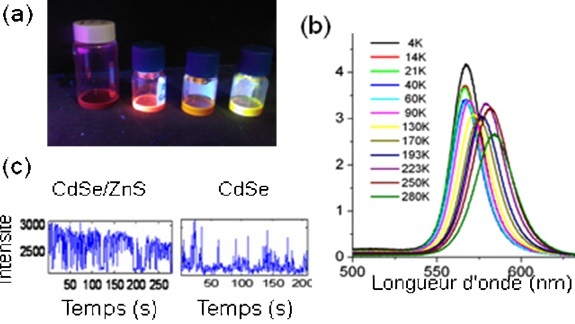 1 : Fluorescence of nanocrystals of CdTeSe synthesized at the ESPCI (left sample) et de CdSe/ZnS synthétisés à l’IMS (3 samples on the right, corresponding to 3 different nanocrystals sizes), illuminated by a UV lamp. (b) Emisison spectra of ensemble of nanocrystals from the IMS at various temperatures. (c) Intensity fluctuations (blinking) of a single nanocrystal from IMS with and without ZnS shell. J. Laverdant, W. Daney de Marcillac, C. Barthou, C. Schwob, L. Coolen, P. Benalloul, P. T. Nga et A. Maître, Experimental determination of fluorescence quantum yield of semiconductor nanocrystals, Materials 4, 1182 (2011). P. T. Nga, V. D. Chinh, V.T. H. Hanh, N. X. Nghia, P.T. Dzung, C. Barthou, P. Benalloul, J. Laverdant, et A. Maître, Optical properties of normal and “giant” multishell CdSe quantum dots for potential application in material science, Int. J. Nanotechnol., Vol. 8, 347 (2011), Special Issue on Nanotechnology in Vietnam. Nga, P.T., Chinh, V.D., Linh, P.T., Cuong, K.C., Hanh, V.T.H. 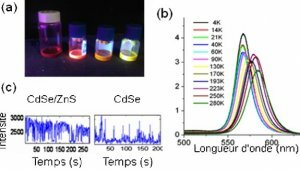 and Nghia, N.X., Barthou, C. Maître, A., The temperature effect on photoluminescence properties of CdSe/ZnS quantum dots, Adv. in Nat. Sci., Vol. 10, 167-174 (2009).